Through 50 puzzles divided into 5 levels of difficulty, test your brain and muscle it! 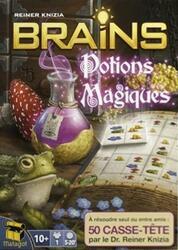 Brains: Magic Potions asks you to complete your grimoire to make your magic potions a success! Alone or with friends, solve puzzles on five different difficulty levels and find the perfect layout to fill your book! Contents of the box : 25 puzzle supports (double-sided), 7 ingredient tiles, 1 rule booklet, 1 clues and solutions booklet.